This is rather unfortunate, as winemaking traditions in Hungary would easily rival those of France. The wine was produced in Hungary since the Roman times, and according to the Wikipedia, Hungarian language is one of only three European languages where words for wine were not derived from Latin (the other two are Greek and Turkish). As most of the countries in Europe, history of Hungary was filled with ups and downs, being conquered and being conqueror, but the wine was thriving through the years, until the phylloxera of the 1870s and communist rule after the World War II delivered their devastating blows. For the last 25 years, there was a lot of hard work done in Hungary to restore the old glory – and the results are starting to show. In today’s wine world, it is hard to be an underdog (change it from “hard” to simply “painful”, if your winemaking traditions are thousand years old) – the battle for the space on the wine shelves of liquor stores and supermarkets is simply fierce. Luckily, Hungary has at least one advantage when it comes to this wine fight – dessert wine called Tokaji. Tokaji is produced out of the white grape called Furmint, in the style similar to the German Riesling and Sauternes, also making the most concentrated wines out of the grapes affected by the Noble Rot (so called botrytized grapes). But general knowledge and availability of the Hungarian wines often starts and ends with Tokaji – and it should not, as Hungary offers a lot more wine deliciousness beyond Tokaji. How can you discover new wines? There are only two ways that I know of. You read about them and you taste them. When it comes to the wines of Hungary, there is one company which dedicated itself to bringing those unique wines to the US market – Blue Danube Wine Company. The company was founded in 2002 with the mission of bringing the best wines from Central Europe (that includes wines from Austria, Hungary, Croatia, Slovenia and Montenegro) to the US market. I heard about the Blue Danube Wine Company a while back, but never had the opportunity to taste the wines they are representing. Last week, the opportunity presented itself in the form of the virtual tasting on Twitter called #winechat. #winechat is the regular weekly event on Twitter, created by Protocol Wine Studio, which focuses on educating and connecting oenophiles and everybody who are “into the wine”, whether as trade professionals or just the amateurs. 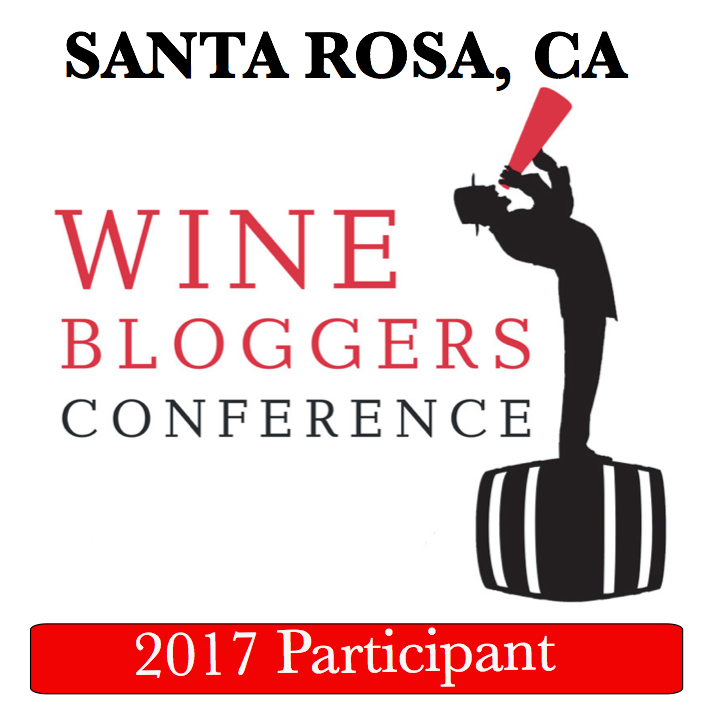 Actually, last week’s event was double-first for me – my first #winechat, and my first encounter with the Blue Danube Wine Company. The way #winechat works is this. The overall #winechat calendar is published on the Protocol Wine Company Facebook page. For each topic, there is a company which hosts the #winechat. In case the wine samples are available, this information is noted on the events page. If you are interested in the theme of the particular #winechat, you contact the host which might or might not have the samples available. On the day of the #winechat, all the participants get together at a given time ( typically 6 PM US Pacific/9 PM US Eastern), and discuss the wines on the Twitter, using the appropriate hashtags – very simple. 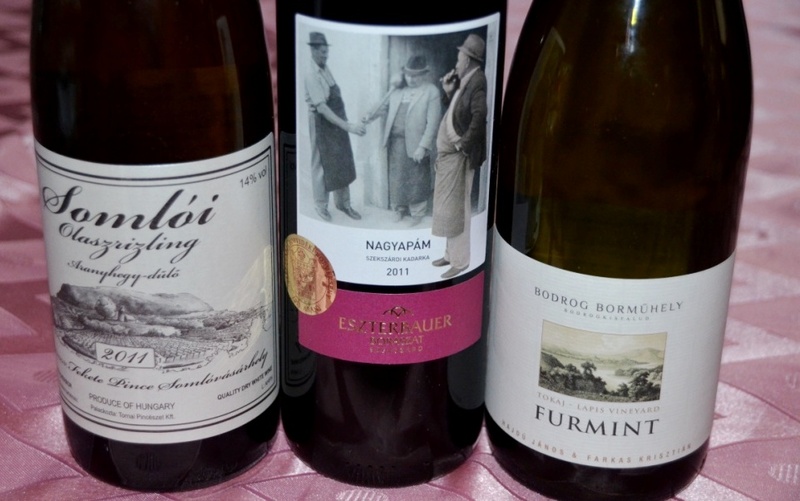 For the #winechat last Wednesday, there were three wines available, made from the grapes called Kadarka (red), Furmint and Olaszrizling (a.k.a. Welchriesling or Riesling Italico). Before the tasting we got the e-mail from the host, giving the tasting order and all the wine notes for these three wines. At 9 PM Eastern, all the fun started. 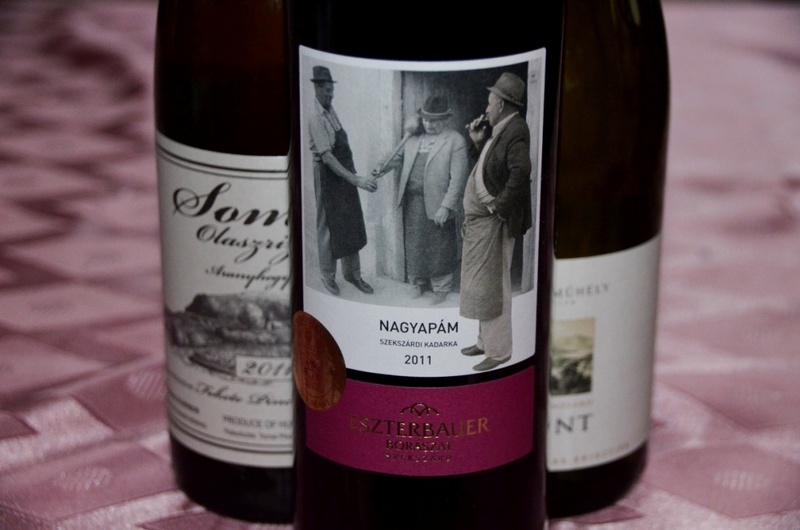 Contrary to what you might expect, we started the tasting from the red wine ( the other two were white) – 2011 Eszterbauer “Nagyapám” Kadarka, Szekszárd, Hungary (13.5% ABV, 100% Kadarka). This wine is made out of the indigenous grape variety called Kadarka, which is also used as part of the blend in Egri Bikavér wines. Kadarka is known to have big berries and thin skin, and makes a pretty difficult variety to work with. Szekszárd region is located south of Budapest (the capital of Hungary), longitude-wise between Bordeaux and Loire, and the vines had being growing in that regions for more than a thousand years. The Eszterbauer family started making wines in the region in 1746, after immigration from Bavaria. The family owns about 20 acres of vineyards, but farms total of 54. There is a number of Kadarka clones which Eszterbauer family uses to produce their wines. The grapes for this particular wine came from the oldest vineyard, hence the name of the wine “Nagyapám”, which means Grandfather in Hungarian. It was recommended to treat this wine like Beaujolais, i.e, drink it slightly chilled. Ask the wine geek to chill the wine, and he (or she) will start playing with thermometer (isn’t it true?) – this is what I did. Here are the tasting notes as I played with the wine. Color: Ruby/garnet color, more of light Pinot Noir style, somewhat dim. Nose: Freshly crashed berries, very similar to Beaujolais with a bit more restraint. Palate: at 13°C/55.4°F, clean acidity, but the wine is too cold, comes through quite astringent. Cranberries and tart cherries, medium to long finish. At 15.6°C/60°F the wine is showing softer in the glass, not as astringent. At 17°C/62.6°F – the best showing so far (at this point the wine is opened for about 50 minutes) – soft, supple, together, with hint of spice in the back. 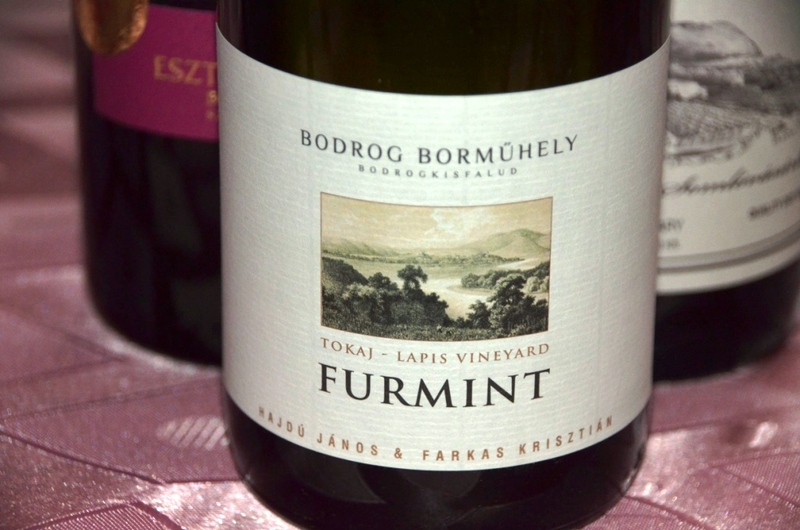 Our next wine was 2011 Bodrog Borműhely Lapis Furmint, Tokaj, Hungary (13% ABV, 100% Furmint). This wine comes from the region of the best known Hungarian wines in the world – Tokaj, and it is made from the same white grape, Furmint. However, while Tokaji is made from the botrytized grapes, this wine is part of the line called Borműhely, which stands for the “wine workshop”, made with the goal of avoiding any of the botrytized grapes in order to showcase Furmint as a foundation for the dry white wines. This particular wine comes from the Lapis Vineyard which is located near the town of Bodrogkeresztúr, and is considered one of the very best vineyards in the Tokaj region. The mixture of soils at the Lapis Vineyard includes some of the volcanic soil, which imparts an additional minerality on the wines. After harvested by hand, this wine was fermented and aged on the lees for the 9 month in the Hungarian oak barrels. Nose: Beautiful – hint of sweetness, caramelized peach, mint, nutty complexity, very unusual. As wine warmed up, nose became phenomenal, almost impossible to describe. Palate: Great acidity, white peach, toasted pecans, beautiful. Nice legs, medium to full body. Last wine of the #winechat was 2011 Fekete Béla Olaszrizling, Somló, Hungary (14.5% ABV, 100% Olaszrizling). You know, I have a problem here. I know very little about Hungarian wines, and all the facts I gave you about the two previous wines were taken from the excellent notes created by the Blue Danube Wine Company (all available on their web site if you care to read them). My problem here? The note for this wine are so interesting that I would love to include them verbatim! But okay, let me try to compress it into the format of the blog post. Somló is the smallest appellation in Hungary, located on what was the underwater volcano in the very old days. You can imagine the richness and diversity of the soils which can be found in the Somló appellation. The winemaking traditions in Somló go back to the 10th century, and the vineyards in the region were always the object of desire for kings and farmers alike. Here is the excerpt from the tasting notes just to give you an illustration of preponderance of the region of Somló: “In 1752, local laws stated that if you were found adding water to wine, expect 25 lashings as the minimum punishment. If you were found to be labeling wine as Somló but using other fruit sources, you would be banned from making wine permanently and might even have your property confiscated. Perhaps most well known is that belief that drinking the wines of Somló before copulation would guarantee a boy. “Nászéjszakák bora” or “wedding wine” was soon the favored wine of the Hapsburgs to keep the Monarchy in full swing.”. This particular wine comes from the winery of Fekete Béla, who had being tending to about 10 acres of vines for more than 30 years. The grapes for this wine were harvested by hand, then fermented with the natural yeast in the 1200 liter Hungarian oak casks, and then aged for two years, never punched down and never completely sealed from the oxygen. You have to taste the resulting wine to believe it. Nose: Wild flowers, tamed, distant, very inviting. Palate: great complexity, very unusual, swings from toasted oats to touch of lemon, granny smith apples, butter, very noticeable legs, crisp and long finish. Noticeable minerality and substantial mid-palate weight. All in all, this was a great tasting and great opportunity to learn something new and expand your palate. Thank you Blue Danube Wine Company and Protocol Wine Studio for all the fun and education! Until the next time – cheers! It was a fun tasting experience, that’s for sure! I’m working on my write-up, as well. Though I’m seriously behind! It’s interesting how different palates interpret the same wines differently. I’m looking forward to the next #winechat adventure!! This was fun, and yes, I’m looking forward to the next one! Anatoli: oooh la la! 😉 I would LOVE to sample the Tokaji you had: I just love them – the more puttonyos, the merrier 😉 and the Riesling: your notes about both wines made me salivate. They really sound delicious! Glad you got to participate in so cool an event. Thanks, Stefano! The Furmint wine was not a Tokaji – it was made in the region of Tokaj, but the wine itself was absolutely dry, so no puttonyos whatsoever. The Olaszrizling was truly unique, worth seeking. What a great event and lucky you getting to sample those wines, I have never had but would love to try Tokaji. It sounds wonderful. 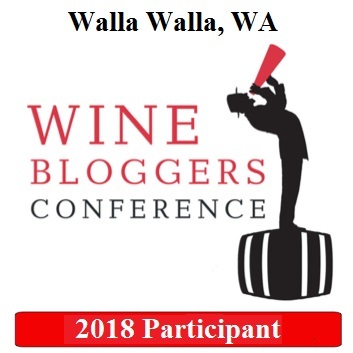 Great report, I love reading about your wine experiences.